Exclusive! Relax in the tranquility of Mother Nature! 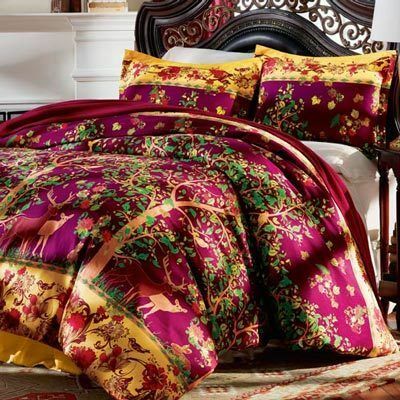 Polyester microfiber Tree of Life Duvet Set is super-soft and easy-care. Button closure. Machine wash. Imported. Hurry! Quantities are limited! I love the tree and animal print. I was a little disappointed in the color. In the add it looks like a very bright purple but it's really more of a maroon color. It's not really soft either but hopefully with wear it will soften. It does look nice on the bed.